Port Colborne, Niagara – June 2012 // Patience, as always, is the key to enjoying Golden Horseshoe bikes and transit travel to the fullest. That, and great flexibility, will get you here, there, everywhere… and then some. With that in mind, I got up at 5:30 am Friday morning to bike down Bay Street to the Toronto Bus Terminal. From there I was looking to hop the 7:00 am Coach Canada highway coach to Fort Erie. 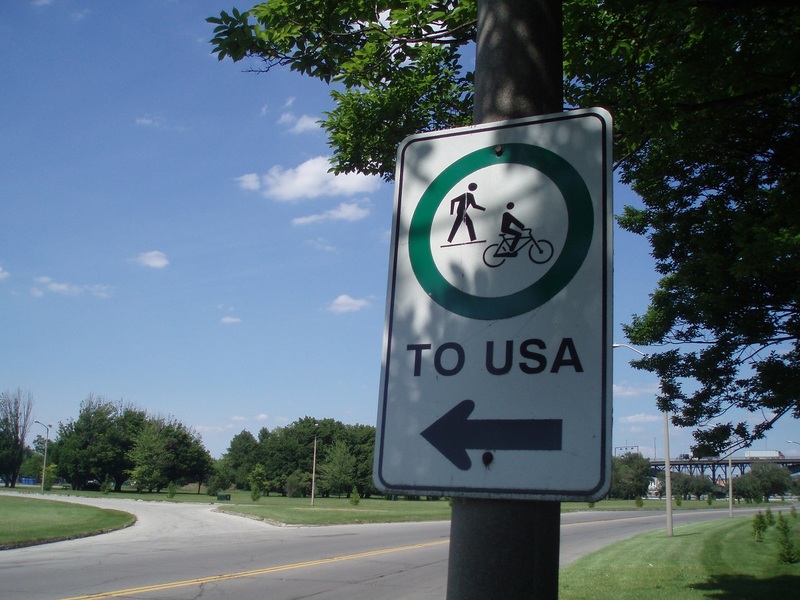 After crossing the Bridge to the USA, I would then cycle north down the Niagara River along the American side – and cross back to Niagara Falls at the Rainbow Bridge, to a Coach Canada or GO Bus home. Despite passport in hand, it didn’t work out that way… the bus from Toronto to Fort Erie that morning (and every morning) is also the bus to Buffalo, and is most often too crowded with luggage underneath to fit a bike. The bus driver suggested trying an early Monday or Tuesday morning bus. There is also a 1:30 pm Coach Canada Niagara bus route that ends in Fort Erie at 4:00 pm. Be sure to remember to use a ‘bike bag’ – available for $10 at the Coach Canada desk at the northwest end of the Bay Street terminal. So presto chango I’m off on the 9:30 am Coach Canada bus to Port Colborne instead! And headed for a different bike ride, one I’ve always wanted to try east along the Friendship Trail to Fort Erie. 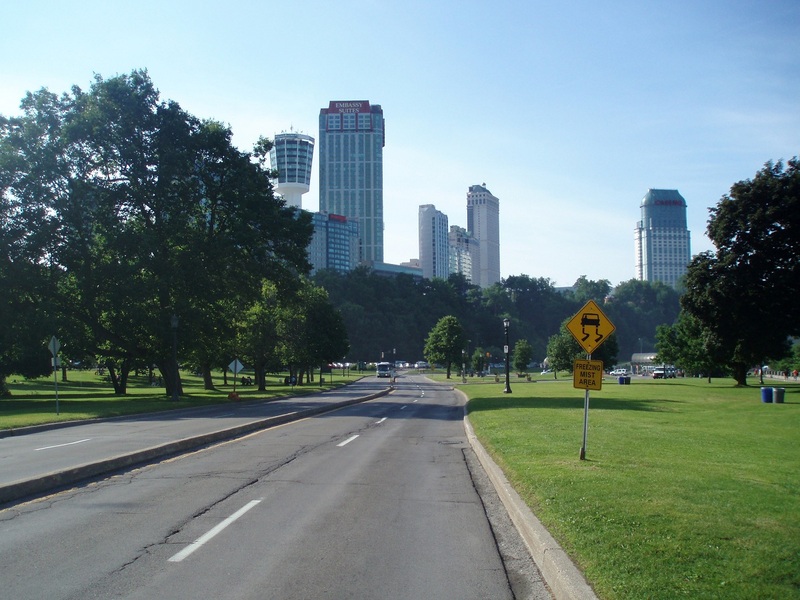 From there, north along the Canadian-side Niagara Region Recreational Trail to Niagara Falls. Remaining flexible, I was happy to arrive by noon in Port Colborne, despite having set out at 6:00 am that morning for Fort Erie. From the bus stop I quickly crossed the Welland Canal – if you miss a drawbridge it can be a long wait – and headed north a bit to get a $2 Niagara Bike Map at the Pedal Bike Shop on Main Street. The ride to Niagara Falls is well marked, so maybe a map is not 100% necessary, but all the better to have one whenever cycling around Niagara. 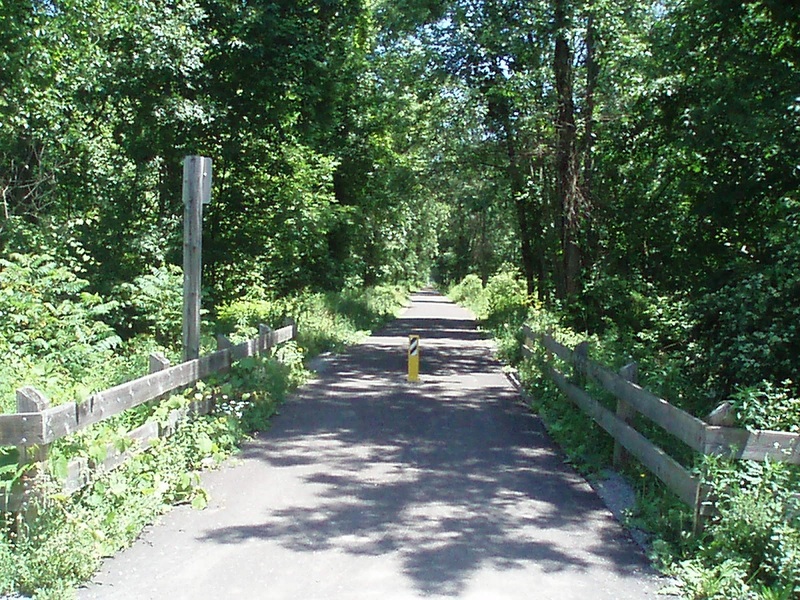 If you ride north along the Welland Canal to St. Catharines, a Niagara Bike Map is essential to follow the ravine trail from Lock Number 7 west to the Coach Canada bus depot in downtown St. Catharines. Before leaving Port Colborne I stocked up on water at Husnik’s grocery store at Davis Street, on the left just after the Friendship Trail begins. A good thing too, because it was quite some time before the trail passed another real opportunity for water or food – about 30 kilometres later in Ridgeway. You can also ride south of the trail about 20 kilometres along to visit Sherkson. 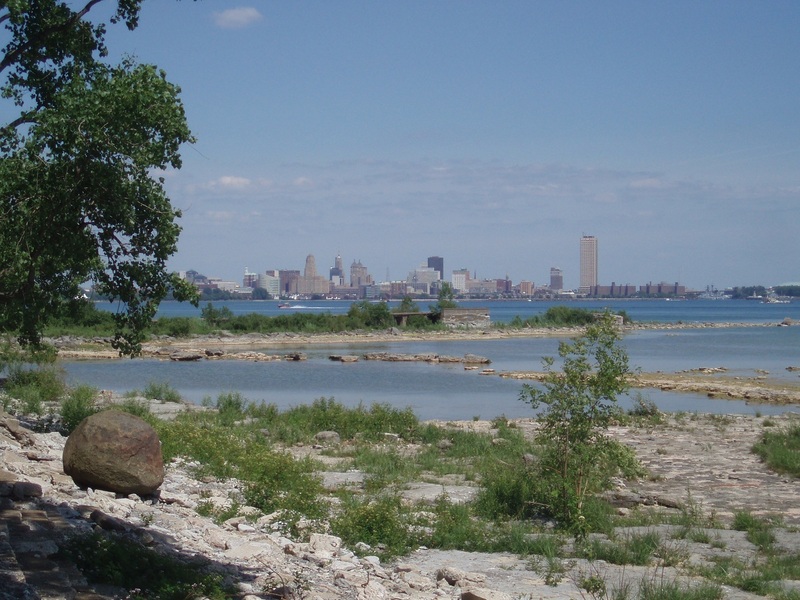 Be sure to keep an ear open for the sounds of the abundant wildlife in the area, and an eye out for a few roads that can take you south to see Lake Erie. Be sure as well to stop within many of the wonderful stretches of wilderness along the trail. 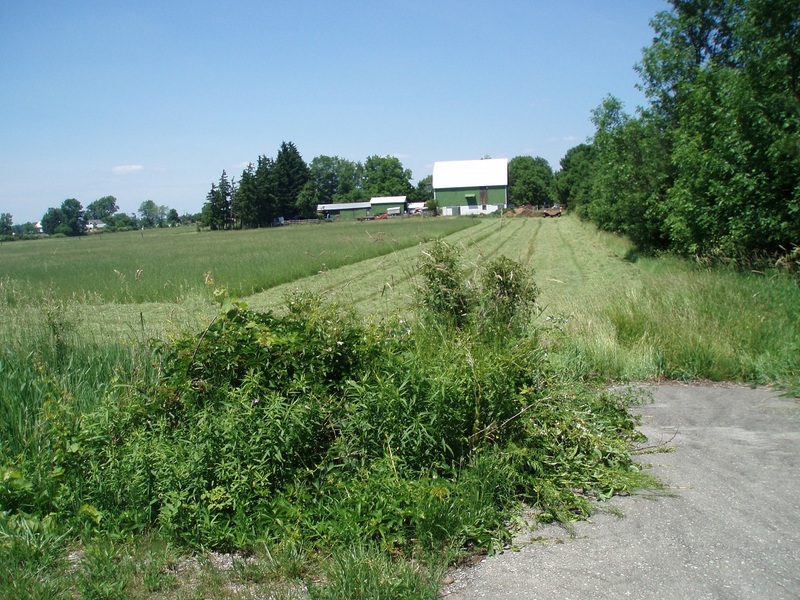 Including scenic farm vistas and dense south Ontario forest, the ride is truly spectacular – and about 99% is smooth asphalt! So don’t worry, and enjoy the pothole free ride all the way to Fort Erie. Do however worry about the bugs – and the dive bombing birds chasing after them! Cyclists best bring a pair of riding goggles or sun glasses. And you’ll need to practice smiling – without opening your mouth! Once you get to Fort Erie the trail heads north. 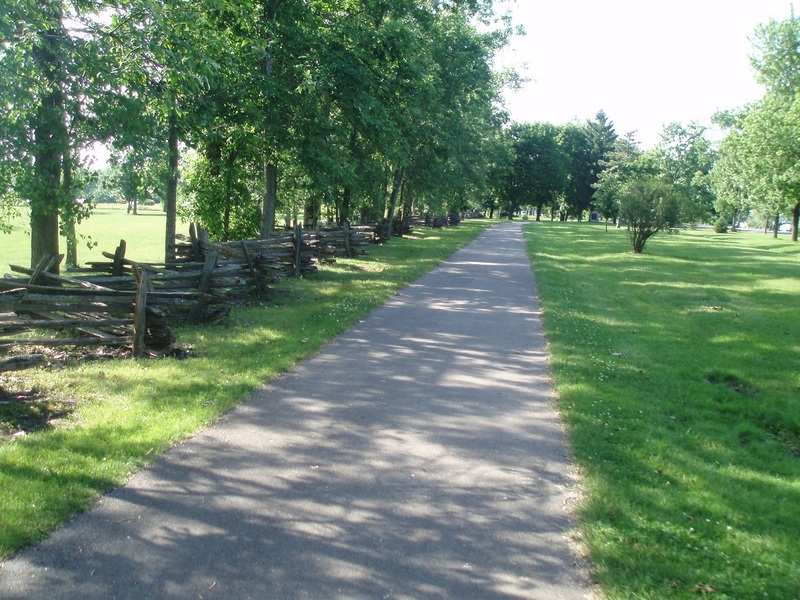 This bike route is part of the Niagara Parkway, is quite old, and is a combination of quiet street front, asphalt trail, steel and wood bridges, and stretches of quiet off-Parkway roads you share with the local residents. If you wish to speed, the Parkway follows on the right the whole way. The only treacherous stretch of the whole day is in the heavy tourist area about two kilometres long right at the famous Falls. 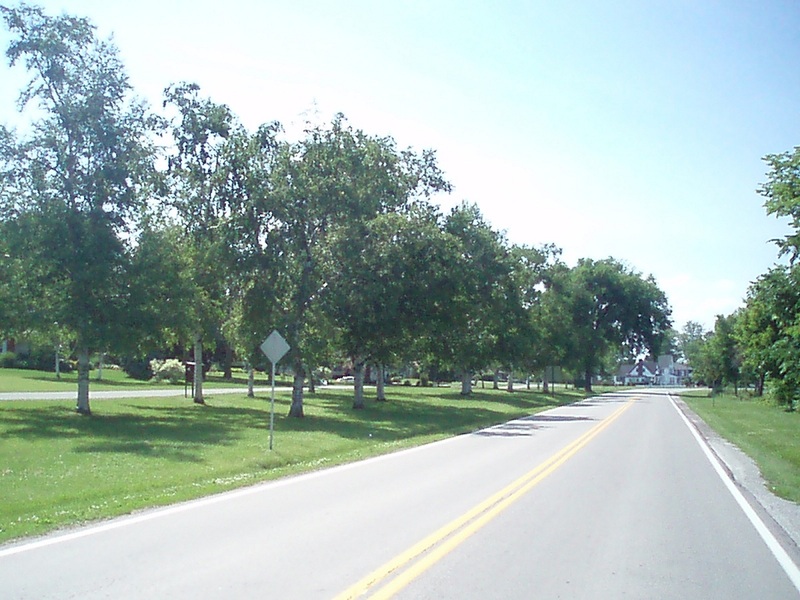 Another option is, after a 35-40 kilometre ride from Port Colborne, to stay overnight in Fort Erie – and carry on to Niagara Falls (Ontario or New York) the next day. If you wish to do so, there are numerous bed and breakfasts and hotels in the area that are members of the Welcome Cyclists Network. Check their website for bike-friendly accommodations around Niagara, and across Ontario. Of course in the summer of 2012, there are dozens of events taking place around this part of Ontario commemorating the War of 1812. 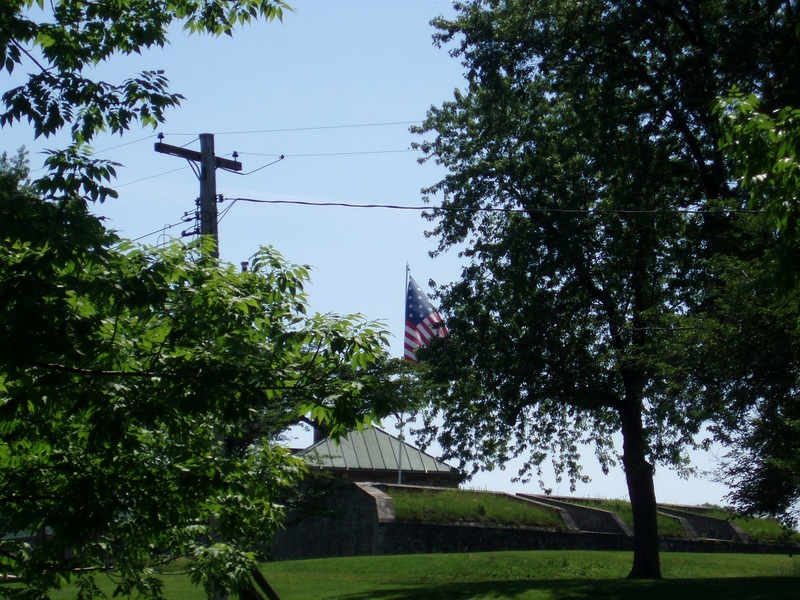 Fort Erie was a key strategic point in the war, and celebrations are scheduled to take place this summer, through 2013 and 2014 (as the “War of 1812” was actually fought over a three year period). For those planning to have a bicycle picnic, the beachfront and parkland opportunities abound. If you want to dine, restaurants are few and far between. 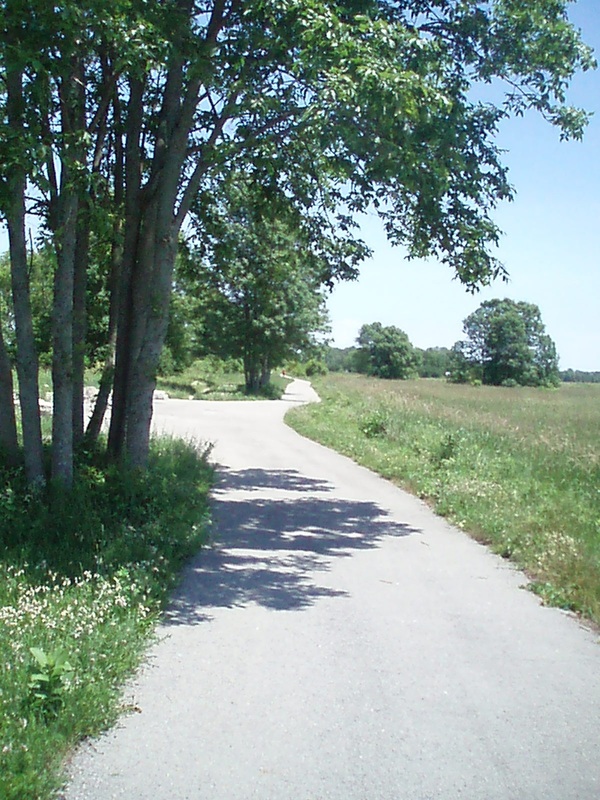 Use a map to find nearby downtown Sherkson or Ridgeway along the Friendship Trail. 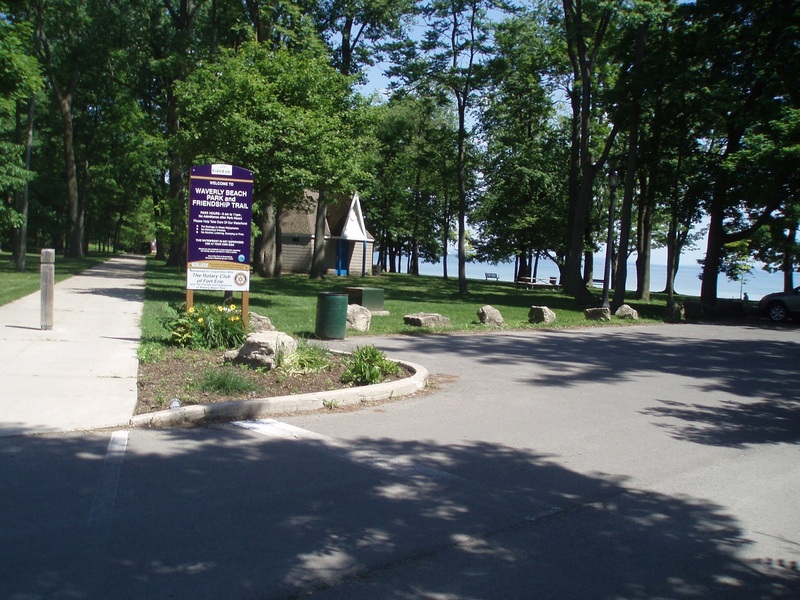 Once you turn north up the Niagara Region Recreational Trail, there are some stores and restaurants along the Fort Erie waterfront, and a marina/restaurant just north of town along the Niagara Parkway. As you pedal through Fort Erie and under the Peace Bridge, notice the “Bridge to USA” sign. 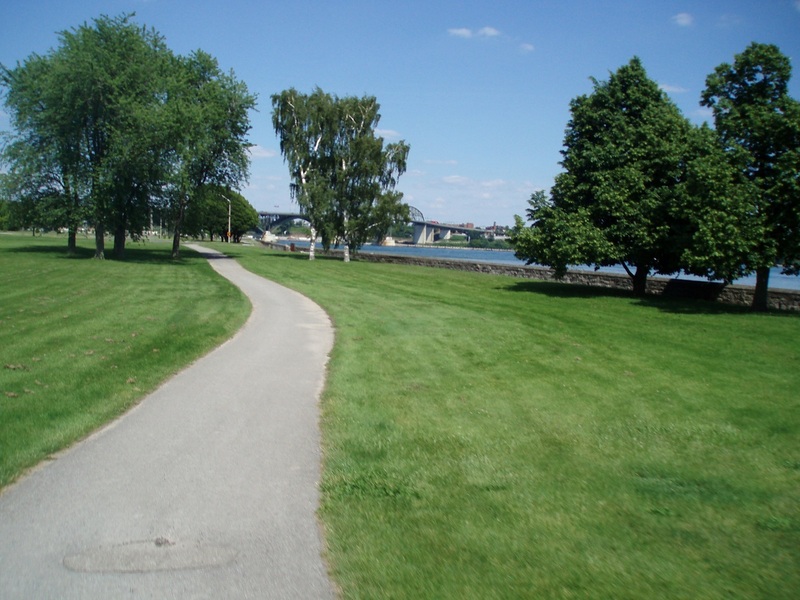 It looks very simple to ride (or walk) across the border to enjoy a day on the American side of the river. 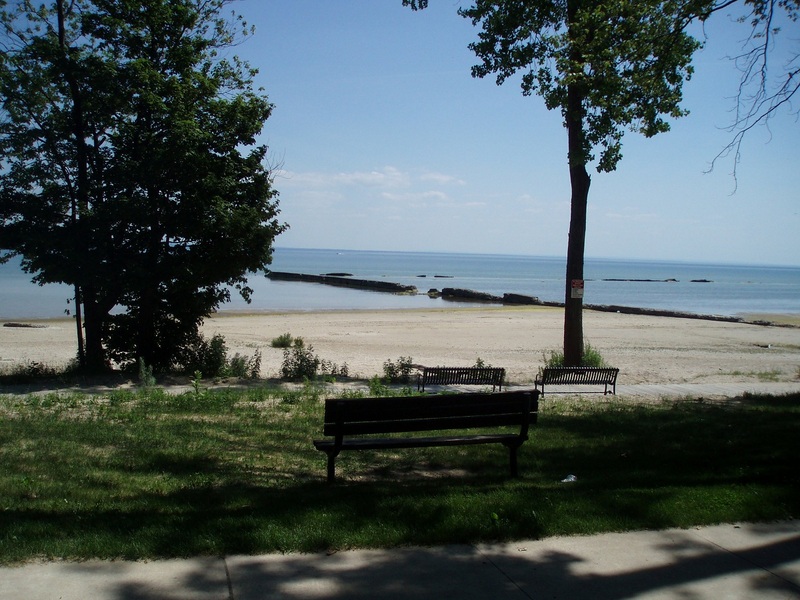 You can also cross the bridge and turn south, for a ride along the south shore of Lake Erie – all the way to Cleveland! 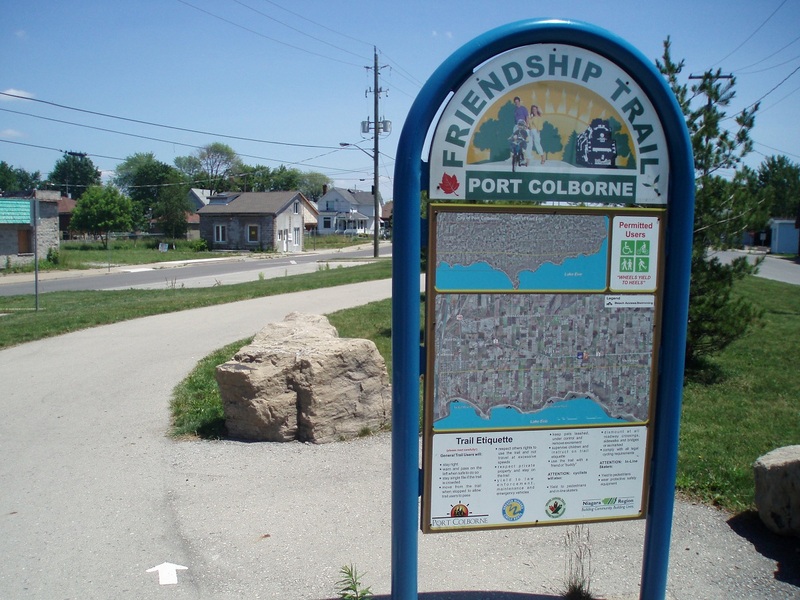 Recent pioneering cyclists’ reports point however to the north shore of Lake Erie – west from Port Colborne – as the next big Ontario cycling destination. The bicycle path and bridges north along the Niagara River on the Canadian side are well-worn, and you’ll meet many groups of tourists, local school kids, casual and serious road cyclists along the way. For a great introduction to cycling the Niagara region, try bringing your bike on the summertime GO Train, from Toronto to Niagara, and ride south from the Falls along the river. At Chippawa there is an important War of 1812 monument to visit, that also makes for a good cycling turnaround point back to the train. At about 5:30 pm I found myself pedaling into Niagara Falls, easily to the GO bus/train station by 6:00. I had made the 70 kilometre trip in 5 hours – and still had 1.5 hours before the 7:30 GO bus to Toronto. There is also a Toronto-bound Coach Canada bus at 8:30 (at the bus terminal across the street from the train station), and another GO bus at 9:30. So, it seems cyclists can ride from Port Colborne to Fort Erie to Niagara Falls somewhat easily in one day – so long as they keep a steady pace and an eye on the time. The day ended in grand style, with a welcomed turn of events. Seems the Friday I chose to ride to Niagara Falls, was also the day Nik Wallenda was to tightrope walk across the gorge. Because of that, the usually chaotic Parkway in front of the Falls was completely closed to cars. Despite thousands of gathering tourists, it was stress free biking all the way to Bridge Street, under the bridge, and left up the hill to the Niagara Falls’ train station and bus terminal. Home and in bed by midnight, it was time to think about what a great five years it’s been for BikesandTransit.com. Since the launch of the 2008 GO-by-Bike to Ajax! pilot project, some 25 local inter-modal routes have been mapped and profiled on the website – for the discovery and enjoyment of cyclists from Oshawa to Toronto, Hamilton, Niagara, and around the world.